United States History at South Texas College - King's "Beyond Vietnam"
The Reverend Martin Luther King, Jr., head of the Southern Christian Leadership Conference, delivers a speech entitled "Beyond Vietnam" in front of 3,000 people at Riverside Church in New York City. In it, he says that there is a common link forming between the civil rights and peace movements. King proposed that the United States stop all bombing of North and South Vietnam; declare a unilateral truce in the hope that it would lead to peace talks; set a date for withdrawal of all troops from Vietnam; and give the National Liberation Front a role in negotiations. King had been a solid supporter of President Lyndon B. Johnson and his Great Society, but he became increasingly concerned about U.S. involvement in Vietnam and, as his concerns became more public, his relationship with the Johnson administration deteriorated. King came to view U.S. intervention in Southeast Asia as little more than imperialism. 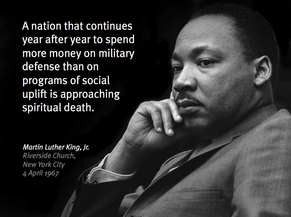 Additionally, he believed that the Vietnam War diverted money and attention from domestic programs created to aid the black poor. Furthermore, he said, 'the war was doing far more than devastating the hopes of the poor at home...We were taking the black young men who had been crippled by our society and sending them eight thousand miles away to guarantee liberties in Southeast Asia which they had not found in southwest Georgia and East Harlem.'" King maintained his antiwar stance and supported peace movements until he was assassinated on April 4, 1968, one year to the day after delivering his Beyond Vietnam speech.